We are moving. First a possibility, then a probability, now a fact. We are leaving this house which has sheltered us for over forty years to be closer to the bosom of our family, and that is an exciting consideration. We will learn to know the newest crop of great-grandchildren as we knew their parents, which distance prevents now. After all these years we are unused to the process of selling a house. When the sign goes up in front of your house, complete strangers drive by and ask the price. Then realtors from all over town come to look at it while you spend your time away from home allowing them to look at your stuff without being able to let them know how much time, money and love you have put into making this house a home. Most of all, Charlie must be removed along with you because he doesn’t understand what’s going on, and let’s everyone know it. The people who come to see what is inside can’t imagine the children who played here or the parade of dogs during all that time who have protected us from all intruders. The essence of joyous holidays and parties still permeate the walls, and the friends who have come and gone through the years have left their mark as well. There are still people who say they remember a special occasion party or two. The kitchen and that 45 year old stove were well worked over until even it had to be replaced a year or two ago. I wonder who will find this house irresistible. Will they love it as we do, watching each tree blossom in the garden, and wait impatiently for each of the fruit trees to yield their bounty? Will they completely replant all the beds with another style? Will they love all the small hidden areas in the large garden? I caution myself to avoid this sort of thinking, because when we moved here so long ago, we changed everything about both house and garden. It’s hard to remember just what it looked like then as we began to make our mark. Trees were removed and others replanted, lawn disappeared and brick replaced it, each brick lovingly placed by Dr. A. Tons of tomatoes and zucchini came and went through the years. A very large pool and fountain came where grandchildren learned to swim and paddle, and I cooled off on hot summer days. When an earthquake cracked it once too often it was removed and things were redesigned once more. Will new children play in the small garden house built by our brother-in-law to resemble a house in Carmel? I will miss the hours spent painting the whimsical creatures inside; will they miss me? I will miss taking my morning coffee there while I contemplate a new painting, or having an afternoon tea with Dr. A talking over the day. Will my painting studio miss me when someone else perhaps uses it as another bedroom? The hours and years I have spent in this crowded and cluttered environment were beyond special. The room was first used by us as a sewing room, with built-in Dutch beds for grandchildren with large toy boxes beneath them. At that time I painted in another room and when we found that grandchildren slept where they wanted to, I moved my stuff in and it became my exclusive domain. There are quite a few of those childhood memories of both Dr. A and me which will need to travel with us. They are the ragged remnants of our roots and our memory. Times have reached the point when family goes around choosing what they might like to own someday when we are through with it. Moving into another home which is a little smaller means than some belongings will not make the cut. We are told to “take it all” and decide later, and I guess that is the simple way. Taking stock of what we own after seventy years is rather awesome, and unsurprisingly includes perhaps a thousand books, a great many of which are too well-loved to discard. I am amused by friends who ask in incredulous voices “Do you WANT to move?” No move is made without great contemplation, weighing the pluses and the minuses. In our case the plus side greatly overweighs the minus. It is the process which is bewildering. We are so lucky to have the help of our two daughters who are managing our move long-distance. Both women are in real estate and both have sold their own homes and moved after years of living in one place. Our new home will await us when this house is claimed by its new owner. It will be fun to write about our new house as we work to make it our home. Young Eileen Ford, nee Ottensoser, who was later to be founder and CEO of the trailblazing and spectacularly successful Ford Modeling Agency of New York, wanted to attend Barnard College in the 1940’s. The problem, however, was that Barnard had a so-called Jewish Quota, which limited the number of Jewish applicants who would be accepted. The solution was simple—she changed her last name. Eileen’s mother, Loretta Ottensoser wanted her daughter to attend a truly high class college for women, and in her estimation, that was Barnard. It rivaled Vassar and it was close to the equivalent men’s Ivy League colleges, such as its “brother” college Columbia, and shared academic activities with all of them in varying degrees. Many American colleges in the 1920’s were quite open about implementing the quota, which they regarded as a matter of racial fairness, not prejudice. ‘Never admit more that 6 Jews, take only 2 Italian Catholics; and take no blacks at all’, was the maxim of the Yale School of medicine, according to David Oshinsky, the biographer of Jonas Salk, the inventor of the Salk polio vaccine, who ended up at New York University rather than at any ivy League school. In 1935, Yale accepted just 5 out of 200 Jewish applicants. The dilemma facing the Ivy League was comparable to that faced today by educators in cities such as New York, where Asian students, less than 10 percent of the city’s student population, routinely win more than 50 percent of the top high school places on merit. Until 1924, entry to U.S. colleges and universities was decided on the basis of an essay written in English, and Jewish students worked hard, often with special tutors, to practice and perfect their essay writing technique–as compared with relatively untutored farm boys and girls from rural schools in the Midwest. The introduction that year of the SAT (Scholastic Aptitude Test) was deliberately designed to counter this advantage by offering all intelligent pupils the equality of boxes to tick, and from 1924 the proportion of Jewish students in U.S. higher education started to fall, through dilution. 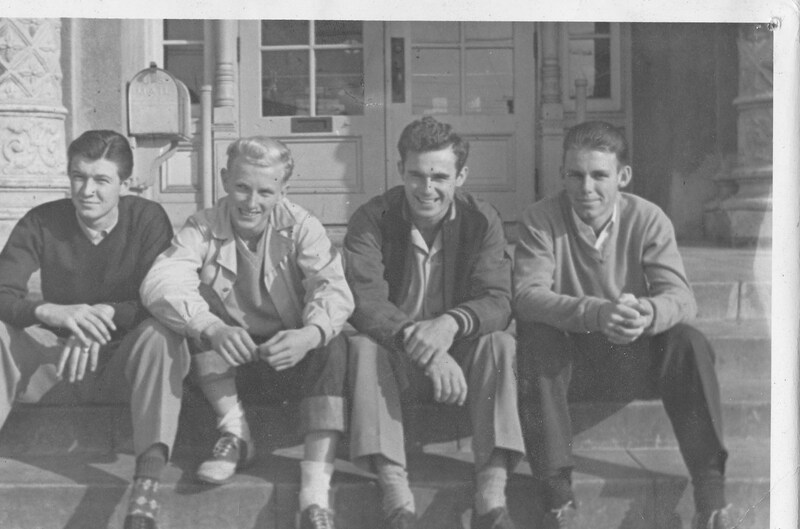 The arrival of increasing numbers of strapping young men and women from the Farm Belt also did no harm to the record of the East Coast’s varsity sports teams. Barnard, to its credit, tried to stand apart from such prejudice. The taboo-breaking college was largely the creation of Annie Nathan Meyer, a self-educated Sephardic Jew who had the clever idea of naming her all-female project in honor of a man, Frederick Barnard, the open-minded president of Columbia in 1889. Virginia Gildersleeve, the college’s dean from 1911 until 1946, disdained religious and racial exclusivity, encouraging the admission of young African-American women to the school and paying to support at least one through to graduation from her own personal funds. Yet, in the interest of diversity, Gildersleeve did seek to dilute the 40 percent preponderance of Jewish students at Barnard in the 1920’s, supplementing the traditional admission essay with psychological test, interviews, and letters of recommendation, so that by the late 1930’s only 20 percent of Barnard women were Jews. This did not totally eliminate Eileen Ottensoser’s chances of gaining entry to Columbia’s sister school, and she had a better chance of securing one of Barnard’s 80 percent of non-Jewish places. The answer was simple; change her name. It was not as if her Quaker-espousing father and Roman Catholic mother had brought her up in any remotely Jewish fashion. Her two younger brothers, age 15 and 11, had already been subjected to anti-semitic sneers at school, and this led the three children to devise a pact. Sometime in the months before Eileen’s senior year in high school and her starting of the college entry process, the brothers banded together with their sister to tell their father that hone of them would go to a university unless he changed the family surname from Ottensoser to Otte. It is hard to recapture feelings which you had 70 years ago. The events of our lives spring up in chapters, but how we actually “felt” at that time escapes us. No one changes their mind more frequently than a teenage girl, and when it comes to boyfriends just when you’re in, you’re out. That’s the way it happened to me the summer of 1944. The new one had a classy little 1936 blue Ford coupe with spotlights and pipes, the old one had a horse. I couldn’t wait to have it parked in front of my house. The occupant also had a blue and gold block sweater to go with it, signature of a high school VIP. In spite of having a steady boyfriend, life went on in my life as a senior at Alameda High. 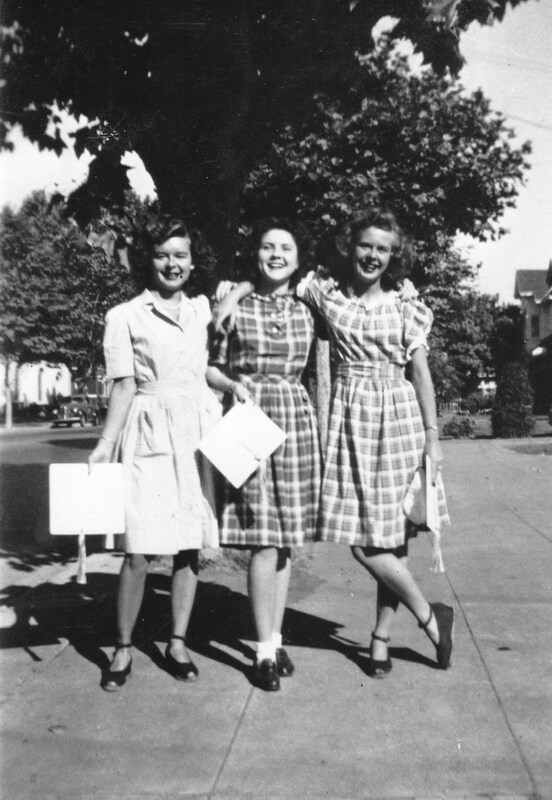 As a result of our being caught drinking in the local movie theater, my friend Nancy Cranmer’s parents shipped her off to Westlake School for Girls in Hollywood, where Shirley Temple was going. My Aunt Connie ( Corinne) campaigned for me to go as well, taking me away from any bad influence I might have in Alameda. My Grandma’s dream of me being a second Shirley Temple when I was a child would mean I would at least be a classmate. Where they planned to get the money was a mute point. I liked Nancy a lot; her nickname was Flea for some reason, and she was in my wedding later on. We discovered that we had a similar event in our family history in that an ancestor was burned at the stake in England. Her ancestor was Thomas Cranmer, Archbishop of Canterbury, and mine was Bishop Nicholas Ridley; Bishop Hugh Latimer joined them in the event. 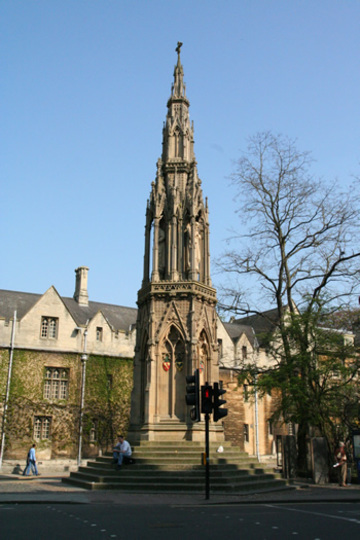 A lovely memorial of the three martyrs stands at Oxford, England, as a grim reminder of Bloody Mary’s power. Meanwhile, the boy with the blue Ford took over my summer, and I found a steady boyfriend in Sam Rasmussen. 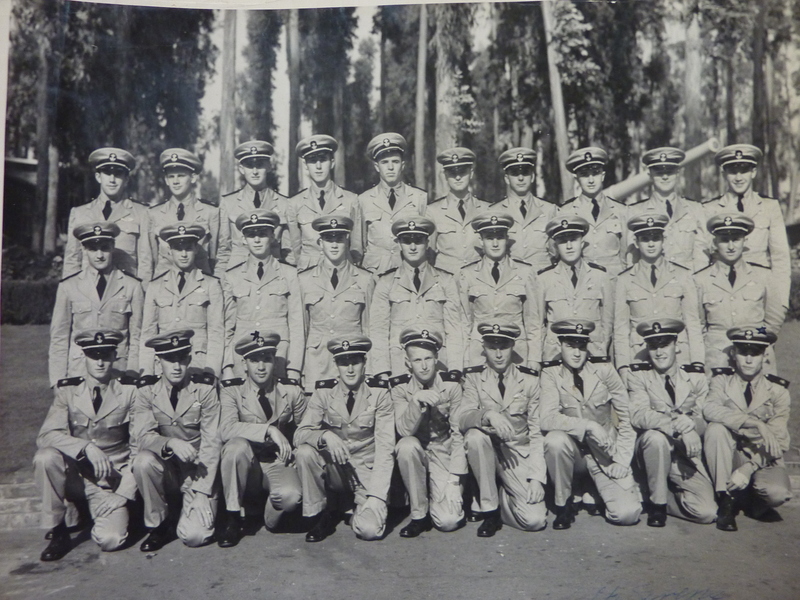 The draft hung like a specter over all our boys, and Sam enlisted in the Merchant Marine Cadet Corps whose training camp was nearby in San Mateo. I had two or three spiffy evening dresses to wear to the weekend dances. Someone had left these lovely dresses on one of the Matson ships, and by virtue of Uncle Fred, I inherited them. There was often something left in a cabin after the ship hit port, with no forwarding address. All in all, I did OK from things rich passengers left on board as they departed. Great Uncle Fred was an executive in the company, and Dad’s cousin was Captain of one of the ships. That’s also how I got my first camera, a fancy Leica. Graduation came for me and it was bittersweet. Sam would be graduating as well and shipping out. The night of my graduation I looked for Sam, but he hadn’t come for some reason. The reason came clear soon enough when I found I had been “dumped”. I spent the rest of the summer on the beach at Cottage Baths in Alameda, feeling sorry for myself, though my mother was understanding about the breakup of my “big romance”, since I was only 17, she and my father, still overseas, felt better than I did about the whole thing. My next move was the same as most graduates; get a job or go to college. I decided to get a job first and think about the rest of my life later.